Welcome to the Packet Pushers Weekly Show. We’re going back to our roots with a community roundtable discussion. In this format, a group of network engineers chew the fat about what’s on their minds related to IT, projects being worked on, the latest sputterings from vendors, and so on. Put in your very favorite earbuds and join us for a frank chat about what’s up. 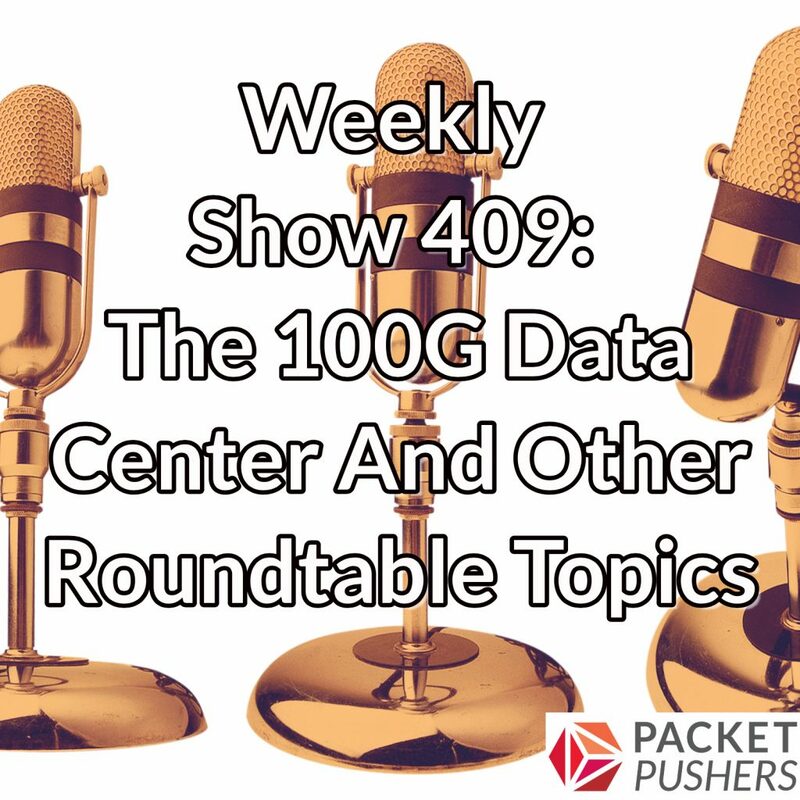 We’ll opine on handling hurricanes with a lack of carrier diversity, refresh cycles for 100GbE, cheap access to Safari Books Online, the all-wireless office, phone home failures, and more. Data center networks need to be faster, more efficient and more agile than ever — and traditional networks just can’t keep up. With disaggregation, a Linux operating system, and automation, Cumulus Networks brings speed, efficiency, agility and cost savings to business of all sizes. Find out how to make the transition to 100G by downloading a free whitepaper at cumulusnetworks.com/100gpod. Regiseter now for the Packet Pushers’ second Virtual Design Clinic on October 11. This live, online event includes deep-dive technical presentations and Ask Me Anything sessions with expert panelists. Go to packetpushers.net/vdc to register for free. And get videos from the first VDC when you join our membership site Ignition. Anyways, it would be nice to hear more round table shows from the pros like this.. always nice to hear different perspectives. There was some debate in this episode whether an ACM membership really gives you access to the full O’Reilly Safari online book library. Indeed, it appears to be so.! I already had an ACM professional membership and I checked. Log in to the ACM website, go to “Learning center” (top-right), and click on Safari (top-right), and voila, there you are. It seems to be access to the full library (not some small subset): I searched on a few very esoteric topics and got lots of books. Excellent show, it is always great to hear from experts out on the field. Any chance you can also include folks in the higher education? Also touch more on campus fabrics with more and more universities looking at lifecycle replacements.